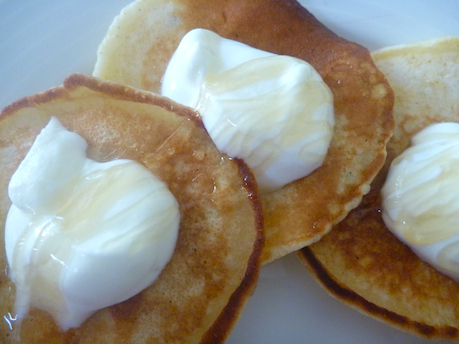 Pikelets, or drop scones, were one of the first things I can remember cooking as a kid. We had an old fashioned electric frypan, which was perfect for cooking fritters and pikelets. I would sit up on the kitchen bench next to the frypan and help my older sister spoon out the batter and flip them. There was always a bit of a debate as to whether the pikelets were ready to flip – we often misjudged it and the pikelet would splash out and make a bit of a mess, so it would have to be re-flipped to cook properly on both sides. One of the perks or cook’s privileges of cooking the pikelets was eating the tiny ‘fairy’ pikelets made from droplets of batter that fell in the pan, and they always seemed extra magically, delicious. 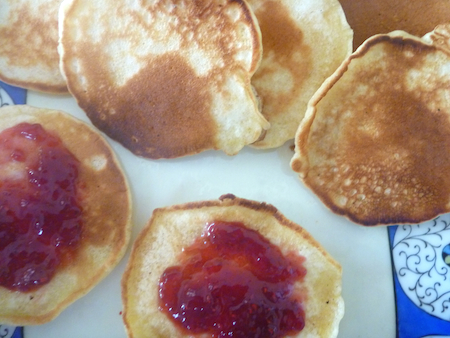 I still love making pikelets for my son and his friends. The smell of the butter sizzling in the pan and the batter cooking gives off a deliciously, homey nostalgic smell of childhood and afternoon tea treats. When warm, they can be served with butter and honey or jam. When cooled, they can be served on a platter with jam and a dollop of cream. I sometimes make them for breakfast and we eat them with a dollop of yoghurt and a drizzle of honey or maple syrup on them. They are a tiny, tasty treat and don’t have quite the sense of excess of a stack of full size pancakes. Any pikelets left over can be kept in an airtight container eaten later in the day. Sift flour and salt into a bowl and make a well in the centre. Beat egg, add to milk then add melted butter. Pour all of milk mixture into the well of flour and stir into a smooth batter. Drop tablespoons of batter onto a heated greased griddle or frypan. Cook until golden, flip and cook until golden on other side. Eat hot with butter and honey or jam. Or cool wrapped in a clean tea towel and serve with jam and cream. Ooh yum yum. I love these, we have them at weekends when there’s a bit more time and serve them all piled high with berries and honey. Blueberries are the favourite in our house, when in season of course.